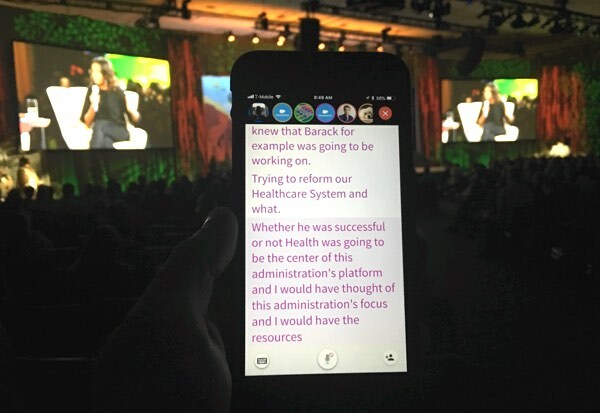 Learn how to join live-captioning at your Ava-equipped venue, or make it happen! Look for signage or communication giving you the venue's Ava Name. Give them information on how they can setup Ava accessibility for this event by sharing this guide. Fill an accessibility request with the button below, so we can help you request accessibility for this event. We'll be in touch to guide you and try to get accessibility for you by contacting the organizers. If we don't have an answer until 1 week before the event, we'll let you know and you may consider the next section. If the venue is small and you can ask help from the presenter, read this guide to setup Ava there. 1) Can you order this and this pieces and get them in time for the event? If so, we advise you to do it. The good news is that you will be able to use these to caption any event you'll need to be at in your life. 3) Can you get another tablet, smartphone or computer (that can access Wifi) than the one you have Ava with? This will help you being ready. Bring both devices charged, and a charger if you can. 4) Come early at the event, and ask if they have any accessibility accommodation. If they don't, explain that you brought your own smart captioner, that can bring captions for you to follow the event, that can be set up in less than 5 minutes. Show the guide you printed and ask to see an audio engineer (usually working at the audio mixers of the room) to try to set it up. 5) Follow the instructions to a) connect the hardware, b) setup one of the device with Ava on. If you can, keep your smartphone charged. If you brought 2 devices, you can leave one of the device near the audio system, and go into the audience, follow the live-captions on your device. If you have Ava Professional or Ava Campus, you'll be able to follow on a computer using Ava Web. 6) Don't forget to get everything back at the end and thank the staff!